Are the leaves turning yellow on your plants? Disease! Insects! Not so fast, the problem could be much simpler than that. Yellowing leaves on plants of any sort can cause distress to any gardener. 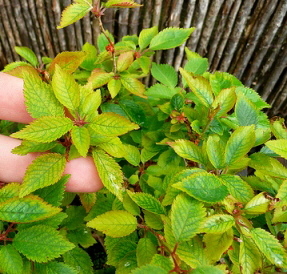 First thoughts, especially for roses with yellowing leaves, is disease. But often the problem is simply caused by a maintenance issue. So before you start searching for treatment, think through the basic needs of the the plant. And certainly, DO NOT water or fertilize until you are fairly certain that will solve the problem. Over watering or over feeding may only result in further stress to the plant. The number one cause of yellow leaves is over watering. So your best immediate course of action is to withhold water, evaluate the conditions and maintenance, and watch the plant carefully for the next couple of days for any sign of further deterioration or improvement. If your plants need more water, typically the leaves will droop, may turn pale or yellow, and eventually brown beginning around the edges of leaves. Yellowing leaves that are not drooping can be a sign of over watering. The roots are drowning (smothering) and can lead to root rot and plant death if the soil does not drain or dry out. Some plants, such as roses, do not like their roots in consistently moist soil. Clay soil is made up of very tiny soil particles that pack tightly together and does not allow water to drain. The leaves will turn yellow. Try to select plants accordingly for the area you are planting. If you have dry shade and add a plant that requires moist soil, then you may likely over water the other plants in order to keep the one plant moist enough. And of course if you a dd a plant that requires moist soil to a hot, sunny, sandy spot you will sacrifice your dry heat lovers to keep the one new plant moist. Every plant has unique requirements that you need to be well aware of. When a plant needs food (fertilizer) the leaves will often turn yellow. Before you automatically feed a yellowed plant, make sure you know when it was last fertilized and how frequently it requires feeding. Grouping your plants according to feeding requirements will make it easier to keep track of a feeding schedule. Annuals typically require frequent feeding to keep them blooming at their best. All plants in a container require more feedingin than if they were planted in the ground. Frequent watering of containers cause nutrients to get washed out of the soil through drainage holes. Roses generally require scheduled feedings. Some shrub roses and rugosa roses are more adaptable. Many perennials do not require heavy fertilizing, but varieties can be dramatically different in their needs. For example, delphiniums are heavy feeds and require regular fertilizing at specific stages of plant and flower development, but most sedums and coneflowers prefer little or no fertilizer. And acid loving plants such as rhododendrons and evergreens, also demand high acidity in their fertilizer. So sometimes regular feeding is not enough, specific nutrient requirements need to be met. 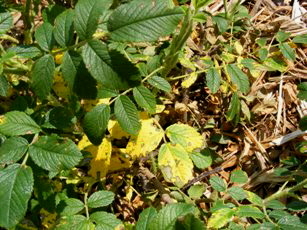 Pale or yellowed leaves can be a sign of either too much sun or too little sun. Double check the sun requirements of the plant and evaluate your planting site. Sometimes a plant that has thrived beautifully for years suddenly pales. Perhaps a nearby try has grown enough to shade the plant substantially. Of course there are other problems that could cause yellowing leaves. If it does not seem clear that you have been over watering or under fertilizing, you need to investigate other causes. You could have nutrient deficiencies in your soil that standard fertilizer will not resolve, so you might want to pick up a soil test kit. Or a virus or pest may be at work, which may take some research to determine. Each plant species are susceptible to specific pests and viruses, so begin a search related to the specific species and cultivar that you are having a problem with. Fruit and vegetable plants sometimes have some fairly specific needs such as iron, calcium or magnesium. Be sure you understand their needs and test your soil. You can add specific and appropriate nutrients and minerals for your crops. Some plant leaves will start to turn yellow as they prepare for dormancy or complete their flowering period, in which case there is no need for alarm. Do, however, determine if that is a natural process for the specific plant at the time of year your plant is turning yellow. For example, when a cranesbill completes its flowering period the leaves often turn pale, yellow, mottled with brown spots, and finally may turn brown and shrivel. Removing spent flower stalks and foliage will refresh the plant and new growth will develop. Some plants may also be very susceptible to drying winds. In sustained or repeated periods of windy conditions may cause leaves to yellow and likely drop or turn brown. And finally, soon after planting, many plants may be a bit stressed from the transplant. If you soaked the soil thoroughly when you planted, just allow the plant a couple of days to recover.